About 70% of North America’s structural sheet-goods manufacturers voluntarily participate in a third-party auditing and certification program through a nonprofit organization called APA—The Engineered Wood Association. More than likely, when you buy a sheet of structural plywood or OSB, it will have a prominent stamp on one side that details the panel’s properties and intended uses. This information is used by architects and structural engineers when specifying products and by the building official during site inspection. It also is helpful to builders faced with various panel options. APA maintains a website (www.apawood.org) where this and other information is available for no charge. Assistance is also available through the APA help desk at 253-620-7400. Sheathing: Intended mainly for roofs and walls, these panels also can be installed as subflooring when used in conjunction with structural wood flooring (such as conventional plank looring) or beneath underlayment-grade plywood or OSB. 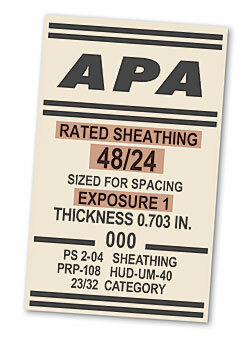 Single-layer floor: The APA labels single-layer subfloor sheathing as Sturd-I-Floor. These panels are used under nonstructural finish flooring such as wall-to-wall carpeting. Sturd-I-Floor panels also have a relatively smooth surface. Plywood is C-p (C-plugged), and OSB is touch-sanded. Underlayment: Designed to be used over subfloor sheathing, underlayment panels provide a base for tile and other nonstructural finish-flooring materials. Siding: Although they are designed to be used as siding—T-111 is one example—these panels are also commonly used for fences, soffits, and other exterior applications. This is the maximum distance between supports—joists, studs, or rafters—that the panel is designed to span safely. These ratings assume that the panel is oriented with the long axis across at least three framing members, and it should be read in the context of the sheet’s panel grade, which is printed directly above it on the label. For example, a Sturd-I-Floor panel is intended for use only as flooring, so it lists only one span rating. Sheathing panels have two numbers separated by a slash, as shown at right. The left-hand number is the maximum on-center distance, in inches, between supports when the sheathing is used on a roof. The right-hand number is the maximum on-center distance, also in inches, between supports when the sheathing is used on a floor. This classification dictates what environmental conditions the panel can withstand. It used to have two additional classes, Interior and Exposure 2, but has recently been limited. Exterior: where full cycles of wetting and drying will occur or where the moisture content of the panel will often be at 19% or higher. Common uses range from siding panels to fences and soffits. Exposure 1: Although they are bonded with the same water-resistant glue used to make exterior panels, these panels don’t necessarily have the same composition and are intended to survive the elements only during construction, about three to six months, with subsequent prolonged moisture content no higher than 16% to 19%. One common example of this class is C-D Exposure 1 sheathing, which is commonly referred to as CDX.